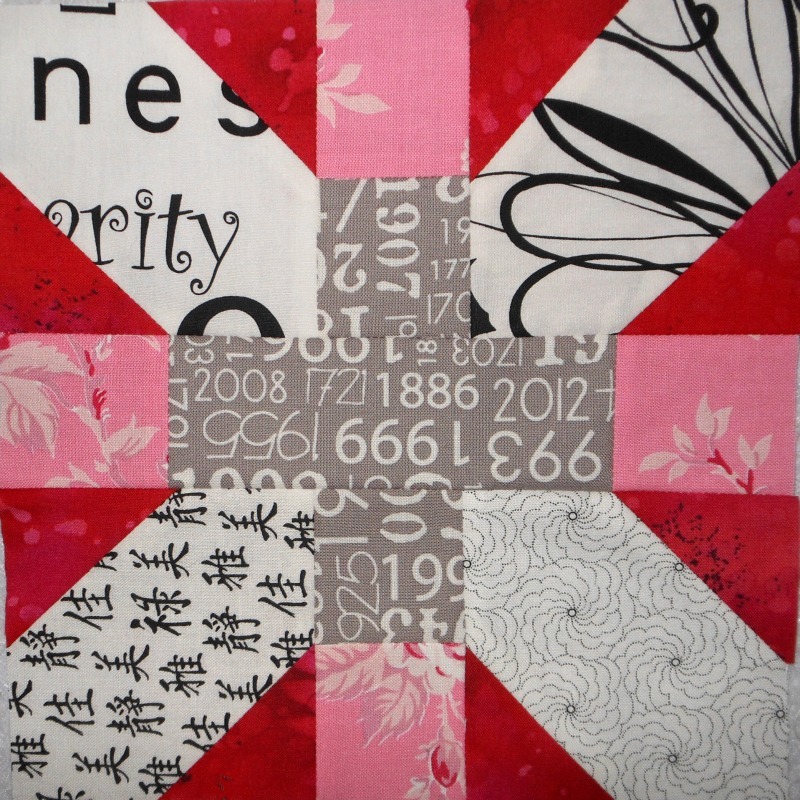 It is WIP Wednesday and the final countdown to our SBAMQG Modern Quilt Retreat. Friday is SO close I can feel it. I'll be able to include some of the super secret projects next week. 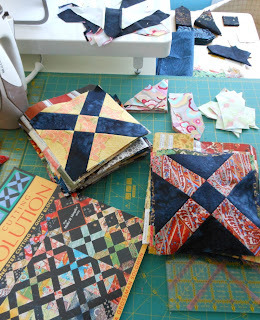 Catching up on my Bee Blocks. I was finally able to finish the six X+ for Emily, F+F=AMSB October and just in time. I like them all but this one is my favorite. November will be Stars in a wonderful colorway for Nico. I'll be taking my 4x5 QCR project with me to the Retreat along with some EPP for Travelling PicStitch Blog Hop. 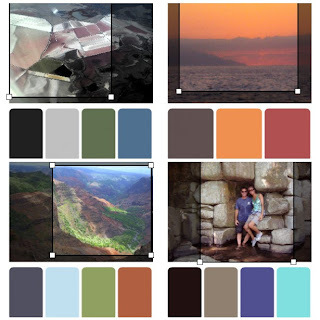 I used Play Craft Palette Builder - check it out and create your own. Be sure to add it to their flickr group too- it's fun to see everyone's version. I'm hoping more people will join and do that. 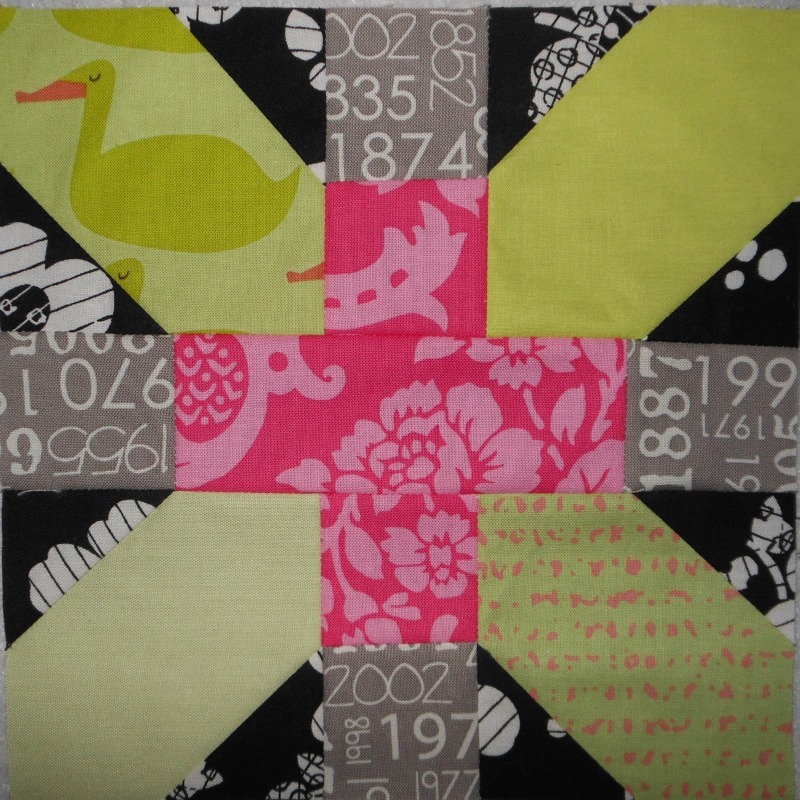 The Baby Quilt on the horizon has changed course. Originally I was going to use the adorable Laurie Wisbrun fabric I've been hoarding but then I was inspired by the bundle I won from Emily at Sewing Summit seen here in my SS: Blast and a Blur post. 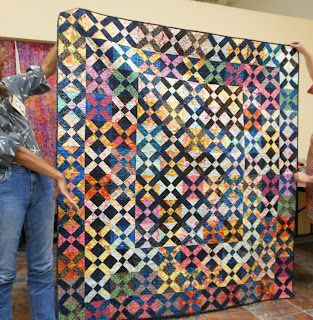 My plan is to make something using a mix of Shore Thing and Going Coastal maybe similar to her Bannerama pattern - but with a twist. Our friend's baby is due in November which I realize is practically now! 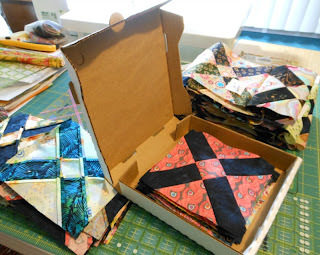 Linking up to WIP with Lee at Freshly Pieced. 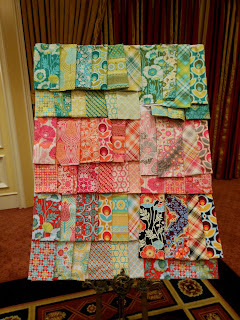 check out Lee's eye candy and all the great linky projects. Blogger's Quilt Festival: my Old Italian Block "OIB"
While everyone is off having the time of their lives at Fall Market and I'm here coming down from the natural high of Sewing Summit, thank goodness for Blogger's Quilt Festival. 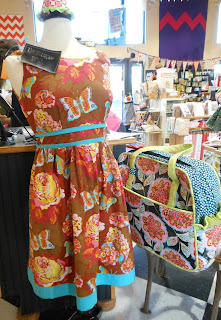 Amy from Amy's Creative Side is nice enough to distract those who can't attend market with this fun event twice a year. October 26 – 31 Linky open, Nov 1 – 4 Nominations are made, Nov 5 -8 Vote for your favorites, Nov 9 Winners announced. 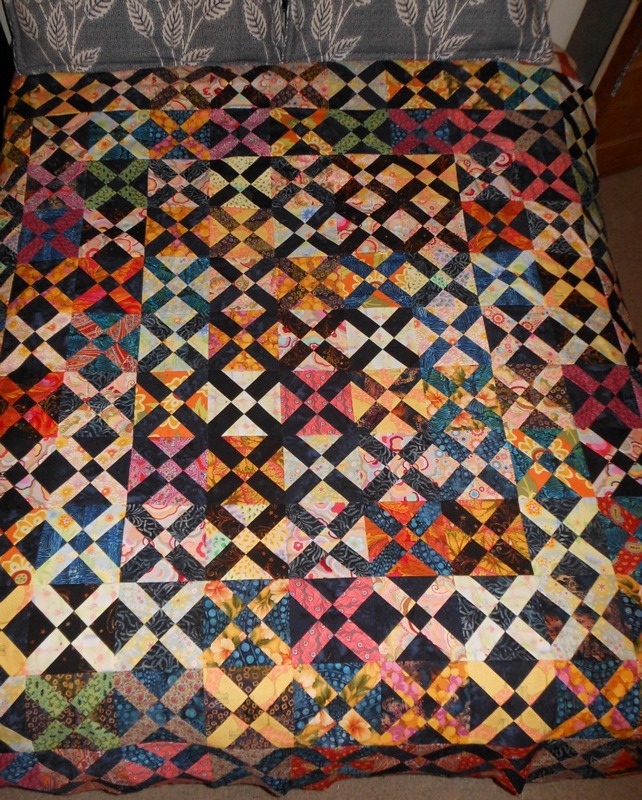 My entry was an easy choice: The Old Italian Block wedding quilt that I made as a surprise wedding gift. 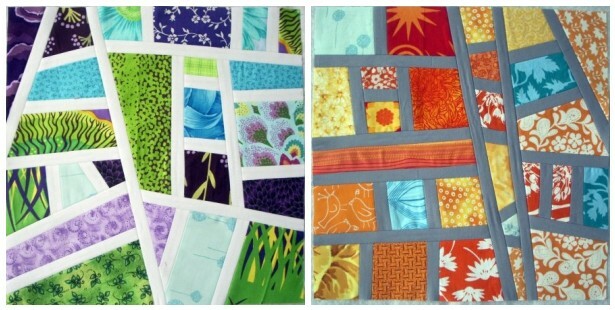 To be honest, I was tickled to have more than one finished quilt to choose from since Spring! Here I am talking with my hands at our MQG meeting - relieved to be finished. 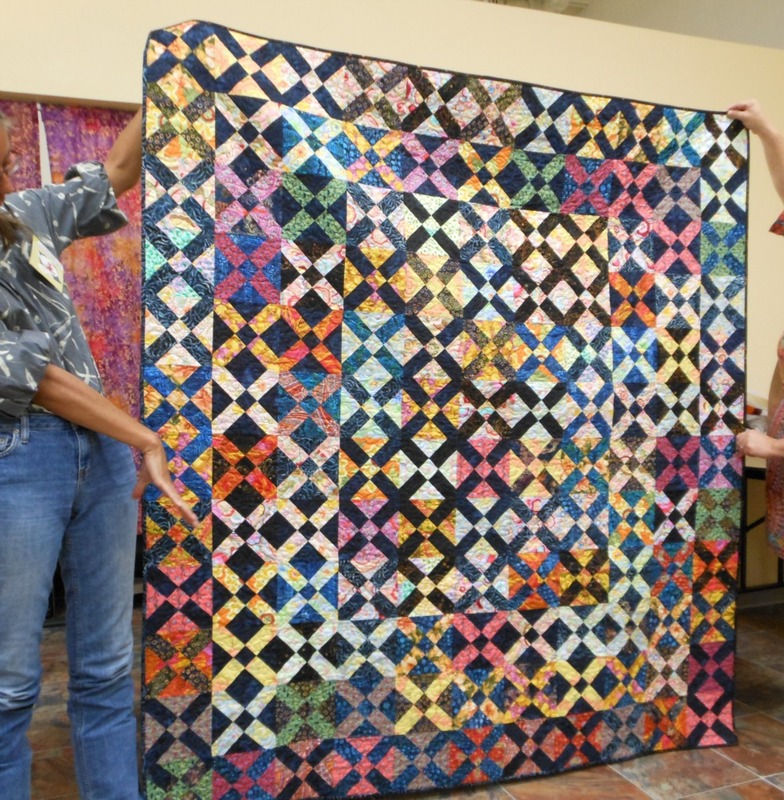 There are many blog posts about the creation of this quilt (seen here, here, here and here) because I knew I wanted to chronicle the steps and sharing the story made the very long process a shorter journey. 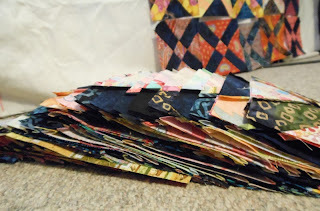 Pulling the fabrics took - um like forever! Value was key and although not your traditional rainbow pattern, I wanted it to cover the entire color wheel and am please to say it does. Organization was also key - and not necessarily my strong point. I couldn't take a wing it/improv approach to this one and needed 132 units in specific combinations. 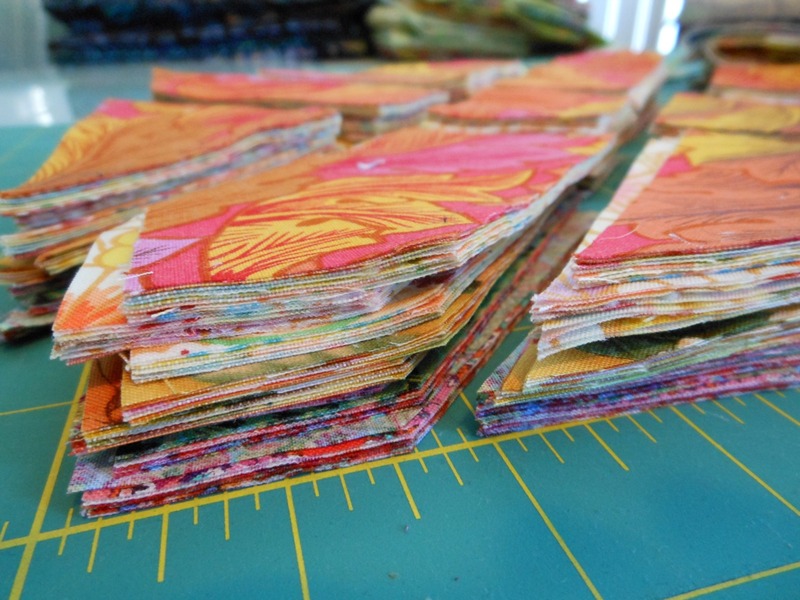 The stack, slice and shuffle method was fun to do. The pizza box was a great tip and in the end I did have a few extra parts because I'm just not that decisive and calculating in my creative process. Working with so much bias was challenging. 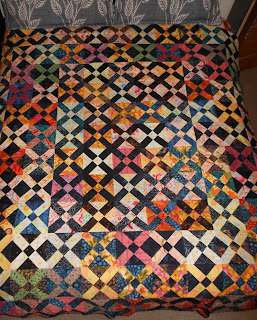 I'm please with how flat the finished quilt lays despite the variety of fabrics used. My motto: Scrappy Rocks! 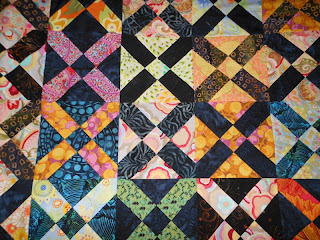 A traditional block with modern designer fabrics like Kaffe Fassett, Martha Negley, Philip Jacobs, Amy Butler, Liberty Art and Monica Solorio-Snow embraces one of my favorite elements of the Modern Quilting aesthetics as well as use of negative space on the back. At times it was tedious I will admit. But I do think that there is something especially gratifying when you finally get to the finish line. In the future, I want to move towards creating my own pattern design rather than replicate a quilt already in existence. It's not the same as the one by Anita Grossman Soloman on the books cover but it's indistinguishably similar. From a distance there is a definite rainbow effect which I adore. Close up it's really shocking how many different fabrics actually get along. When it was hanging at our MQG show I had more than one person comment about how puzzled they were that one fabric could actually look good next to another and be cohesive. 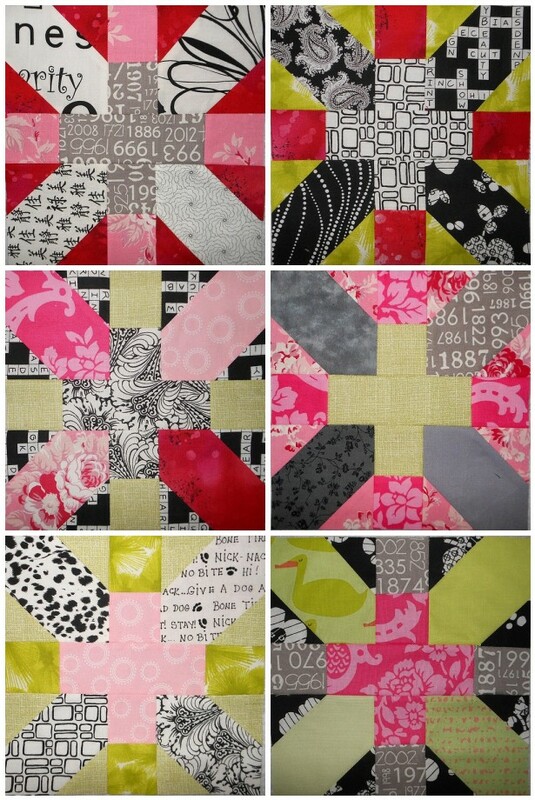 If you saw them on a bolt, you'd never dream of mixing them in the same quilt - but I did! 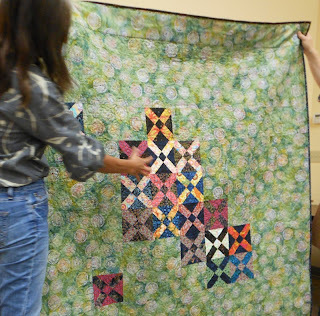 Last Spring I entered Quilter's Festival for the first time with the Mod Mosaic aka Catalyst and reading that post from May brings me full circle. I got to meet them in person! Small world: here it is a year and a half later and two of the ladies I got to hang out with were from the 3x6 bee I made these two Mod Mosaic blocks for: Nydia and Shawn. I never would have guessed that twist. Returning to reality is not an easy task. Finding a home for all my swag and shop hop goodies took some doing but alas I did locate the table under it all and began to sew again. October is flying by and I finally had a chance to work on the x+ blocks for F+F=AMSB. Deciding on fabrics and cutting (almost) all of the parts is as far as I've gotten. Emily posted her block choice before I left for Sewing Summit and it was all I could do to stay focused and refrain from starting - this group manages to pick the top of my to do list designs every time. 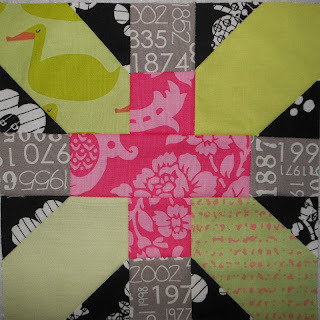 Her colors are hot pink, gray, black/white, text and chartreuse: all readily available in my stash. Somehow in my Sewing Summit Recap posts here, here and here... I manage to miss picturing the WIP from Amy's Precise Piecing class. Could it be that I hadn't fully unpacks everything by chance? They look all wonky from having been crammed in a suitcase but they measure up nice and precise thanks to her tips and tricks. Amy was so great about sending us all home with the parts and directions for the remaining blocks. Starching may be my new best friend after working this way. The QCR curve-it-up Churndash for the 4x5 bee is the block I'll be making for my hive. Just need to dust off my favorite ruler and get busy. Jenny and her sister are coming up with such great variety I'm happy to tag along in the QAL even if I can't find time to make them all. I signed up for the Post-Summit Swap and will have my partner assignment soon. I'm glad it's a quick turn around and am excited to create something special. Posting to the recap linky should count as a finish, right? I'm loving seeing all the pictures and comments. 73 and growing - I hope everyone will link to a post in the end. Now that the new roof is on we're testing out house paint colors. The body (lower left) is a bit less gray and more khaki green, we really like it. There are so many decisions to be made about which color goes where because of the California Bungalow style that it is. For now it's up in the air but getting closer. It'll be a fun day to post my first finished quilt on the porch photo with the house all done. Linking up to WIP with Lee at Freshly Pieced. 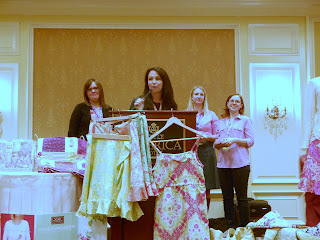 Trying to capture my experience at Sewing Summit and express it all in a recap post for the link up is a daunting task. How do I do it justice without writing a novel? - I've been home an entire week! 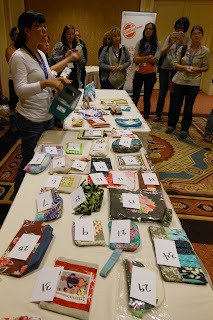 Exchanging cards was so much fun - keep in touch! Fortunately, there are advantages to my procrastination - so much has already been said so nicely with pictures way better than mine and that allows me to link you to some post-SS-posts in addition to what I have to share and my previous posts here and here. Being mentioned and pictured on SS'12 Recap posts like Babylock's totally stitchin' and at my friends Debbie @ A Quilters Table and Ella @ Throw a Wrench in the Works Tracey Swell Sewing makes me smile- thanks guys! I rarely travel. I almost never travel alone. Despite that, I was surprisingly calm at the prospect of knowing no one thanks to the supportive accepting nature of the blogging/sewing online community I've grown a bit addicted to. Right from the airport sighting of handmade bags and a shared ride to Little America on Wednesday, I felt at home with these wonderful bunch of strangers. Jessie Tiny House, Tracey Swell Sewing, Tsoniki Me Being Crafty and my roomy Kristen strolled around after lunch and found the uber cool Decades Vintage Clothing along with the very random "cupcake shakes" at the mustached Sammy's Cafe. 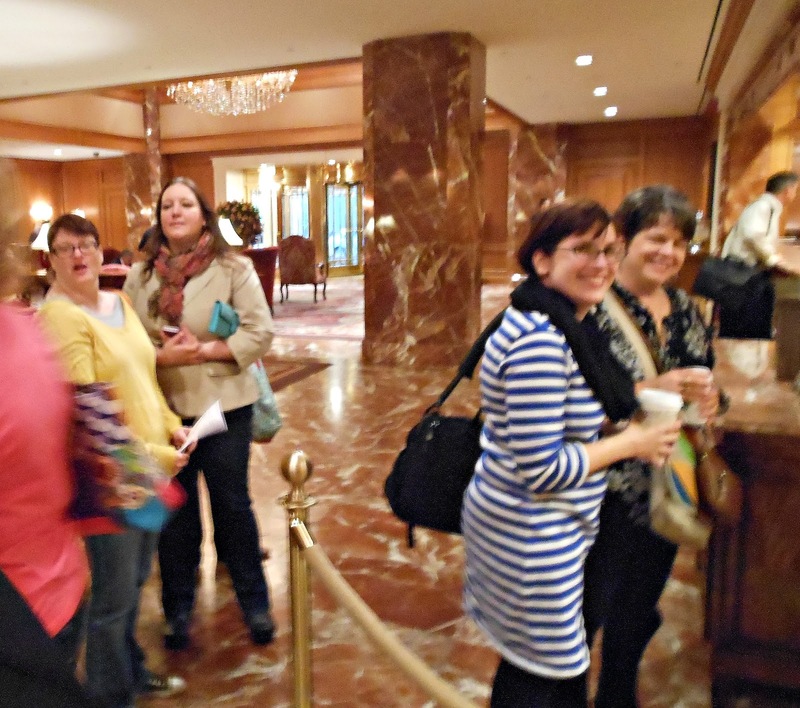 A big group joined us and walked to The Tin Angel I'm so bad with names I can't list them all even with the round of introductions but trust me, they were all terrific including Leigh from London, Janice, Texas Fi and Elena Hot Pink Stitches. We talked about everything and I mean everything! Lunch at Cafe Rio hit the spot and crossing the street with an arm full of bolts at Quilts Etc. just cracks me up. SS'12 has inspired me to branch out from quilting and tackle garments and bags - dare I include a weekender? 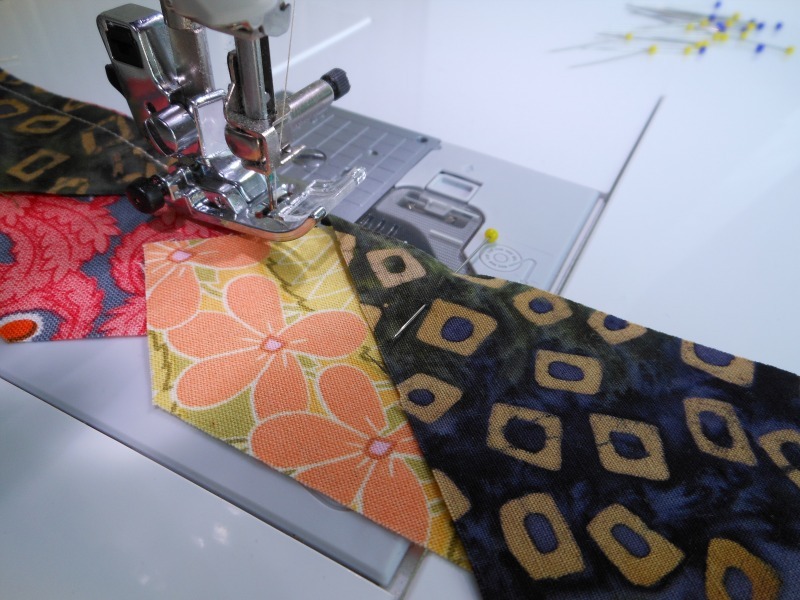 Speaking of fabric... I seriously want the entire collection! Be sure to check out the bunting in the bar from the mixer - how did I not capture that? Good thing Liz did. Hysterical. Dinner at Red Rock Brewery. I brought home a t-shirt for hubby. 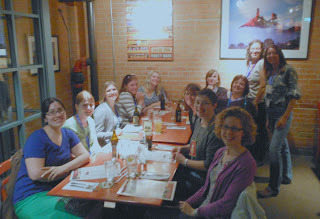 There's a picture of my table with Deb, Whitney and Erin posted by Lisa here. 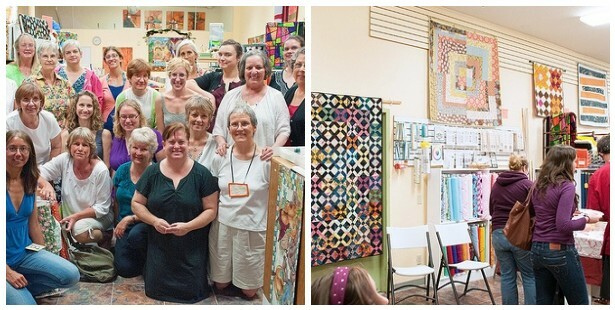 Opening Night Mixer sponsored by Craftsy included a free class. The teachers and organizers were amazingly generous and approachable. Never Give Up - So Encouraging! Packed for the flight home. I could barely zip my suitcase. I had to shuffle stuff around and weighed in at 45lbs for the check on - 5 lbs to spare. Well, I wrote a novel after all and realize I didn't even get a proper picture of the goodies in my Mood Swag Bag. Hopefully someday soon I'll be posting finished project made from all the loot.